The range of frequencies or wavelengths of electromagnetic radiation is called the electromagnetic spectrum. It includes radio waves, infrared radiation, visible light, ultraviolet waves, x-arays, and gamma radiation. Within radio waves are AM radio, TV waves, FM radio, and microwaves. The full electromagnetic spectrum shows an enormous range of frequencies. An important part of that range is the visible light spectrum. How are electromagnetic waves created? What is the spectrum or frequencies and wavelengths? Electromagnetic waves are created by the acceleration or oscillation of electrical charges, such as the movement of electrons. In AC electricity, electrons move back-and-forth in a wire at a relatively slow rate. In radio and microwave devices, circuitry oscillate the electrons at a much higher rate. Molecules, atoms and free electrons move about rapidly when heated to high temperatures. Also electrons accelerate when jumping from one electron level to another. Finally, collisions of high energy electrons result in the creation of x-rays. That equation can be rewritten as f = c/λ or λ = c/f, depending on which variable you want to find. The frequency of electromagnetic waves ranges from less than 50 Hz, which to beyond 1019 Hz. The wavelength of electromagnetic waves ranges from over 6000 km to 1 Å (Angstrom). The colors of the visible spectrum are in the order of the "name" ROY G BIV (Red, Orange, Yellow, Green, Blue, Indigo, Violet). 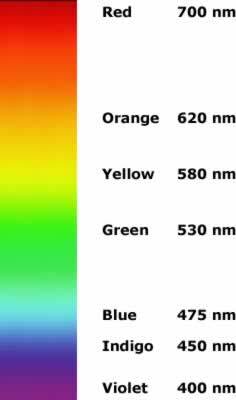 The illustration below shows the colors of the visible spectrum and their approximate wavelengths. The colors aren't evenly spaced because the bands of each colors varies. For example, the green colors cover a wider area than does indigo, which really could be considered violet. The electromagnetic spectrum is the range of frequencies or wavelengths of electromagnetic radiation, including x-rays, visible light, microwaves and television waves. The rate of oscillation of electrical charges determines the frequency of the radiation. A simple equation shows the relationship between frequency and wavelength. The full electromagnetic spectrum shows an enormous range of frequencies. An important part of that range is the visible light spectrum.